A crop of Raid71's Spider-Gwen print. 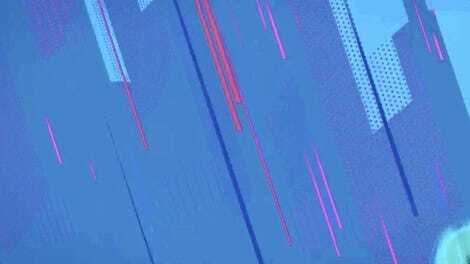 It’s been over a month and we’re still not over the excellence that is Spider-Man: Into the Spider-Verse. 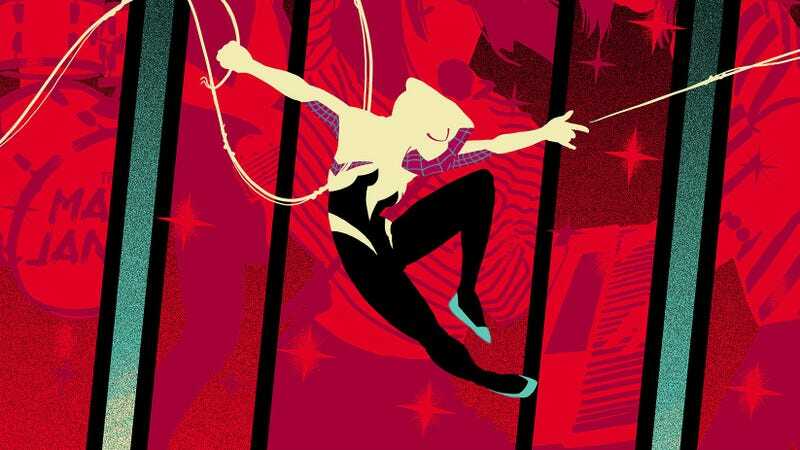 And whether the movie sent you down the rabbit hole of related Spider-Man comics or not, you will definitely appreciate this new Spider-Gwen poster. Spider-Gwen by Raid71 is an officially licensed, 18 x 24 inch, hand-numbered screen print in an edition of 125. It goes on sale Thursday, February 7 at 1:00 p.m. EST via Grey Matter Art for $40. 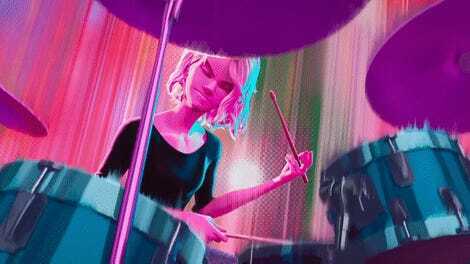 If you only know Spider-Gwen because of Spider-Verse, you may not realize in the comics, she was part of a band called the Mary Janes along with Mary Jane Watson. That’s the inspiration for the poster, obviously. And if you’re so inclined, at the same time on Thursday, Grey Matter has a second Spider-themed poster going on sale. It’s Spider-Man vs. Green Goblin by Doaly, and is another 18 x 24 inch, hand-numbered screen print in an edition of 100 that costs $40. Spider-Man vs. Green Goblin by Doaly. Again, both posters are on sale Thursday, February 7 at 1:00 p.m. EST at Grey Matter Art. And yes, a Spider-Gwen movie is currently in development.